PlayStation 4 version coming eventually? Magic Design Studios' action/adventure platformer, Unruly Heroes, is now available on the PC, Xbox One, and Nintendo Switch. This retelling of the "Journey to the West" story lets players team up on a couch and play as Wukong the Monkey King, Sanzang the Sleepy Monk, Kihong the Greedy Pig, Sandmonk the Sensitive Brute as they search for the remnants of the Sacred Scroll. 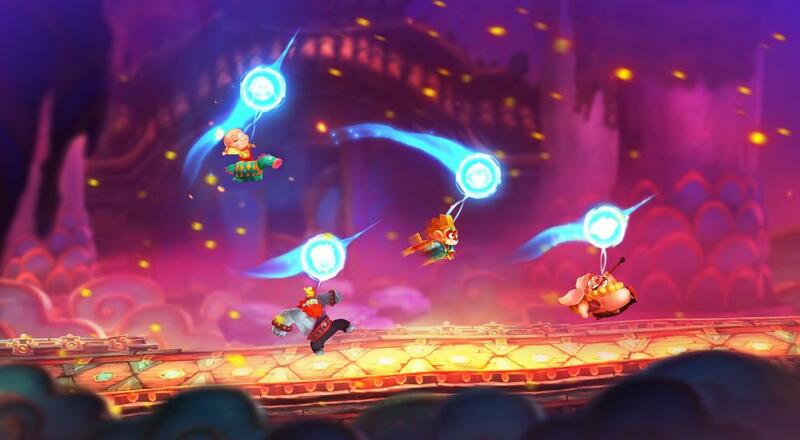 Visually, the Unruly Heroes is incredibly striking and reminds me of Ubisoft's Rayman Legends from 2013, which is absolutely fine by me. Much of the action in the launch trailer appears to be a mix of platforming and side-scrolling brawling, and while the single-player experience has you switching back and forth between the different heroes to traverse various obstacles, playing with friends means everyone's got something to do. Unruly Heroes is available now on PC, Xbox One, and Nintendo Switch. Four player couch co-op is supported throughout the campaign. A PlayStation 4 version is planned for release at some point in the future. Page created in 1.2687 seconds.